In March 2017, the Business, Energy and Industrial Strategy (BEIS) Committee launched an inquiry into Electric Vehicles. The inquiry was to examine the barriers to the development of the electric vehicle market and what support this emerging market might need. The committee invited submissions of written evidence. SPACE for Gosforth decided to submit written evidence as we wanted to ensure that the inquiry considered electric bicycles (“E-bikes”) as well as electric cars and other vehicles (“electric vehicles”). We also wanted to make sure that the effect that electric vehicles will have on pollution was examined. In general terms, SPACE for Gosforth welcomes the switch from petrol and diesel engines to electric ones as these will reduce some forms of pollution, particularly greenhouse gas emissions, noise and local oxides of nitrogen (NOx) air pollution. NOx includes nitrogen dioxide – illegal levels of this pollution in Newcastle upon Tyne led to the creation of both the South Gosforth and the City Centre Air Quality Management Areas. However, a switch to electric vehicles will not bring about a reduction in particulate air pollution (which our monitoring suggests may also be an issue in Gosforth) nor other problems related to car use such as excess delays, accidents and physical inactivity. 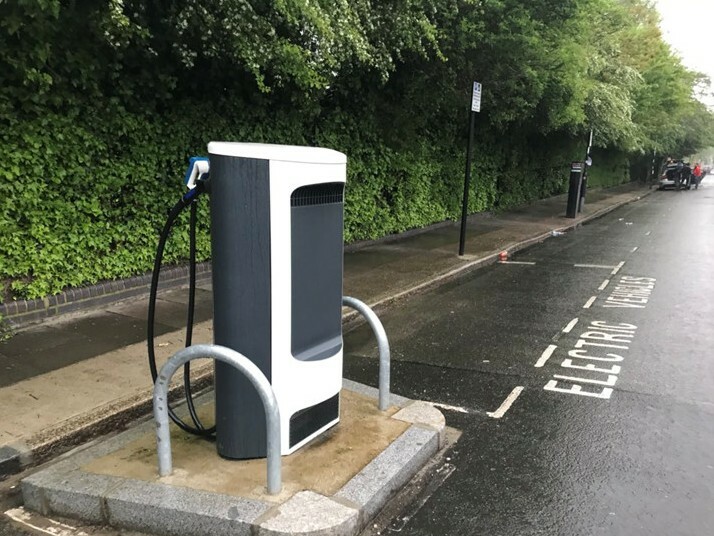 Consequently SPACE for Gosforth considers that while the switch to electric vehicles is welcome, it does not replace the need for a shift in transport from people using cars to active modes of transport (such as walking and cycling) and to public transport. SPACE for Gosforth therefore wished to submit that initiatives to encourage the use of electric vehicles must not undermine the take-up of these alternative, and more sustainable, forms of transport. improve public health through increased activity. SPACE for Gosforth particularly wished to draw the committee’s attention to two benefits of E-bikes: firstly they can enable people to stay active in later life as the assistance of battery power means that people who are unable to ride a standard bicycle, for example due to ill health, may be able to ride an electric one. The second advantage is that E-bikes have considerable potential for increasing the amount of freight delivered by bicycle, which could be particularly useful in areas such as Grainger Town and the rest of the City Centre where there is a need to reduce traffic on major access routes such as the Tyne Bridge. SPACE for Gosforth therefore recommended that the two barriers to the uptake of E-bikes are addressed in order to encourage their use. The first barrier is the lack of safe cycling infrastructure and we recommended that this should be provided. The second barrier is the cost of purchase of an E-bike and we recommended that there should be a subsidy to stimulate sales. This would be comparable to the way the initial take-up of Electric Vehicles was supported through infrastructure measures (charging points) and through purchase support. SPACE for Gosforth wanted to particularly make this submission as we were concerned that the Government’s Industrial Strategy did not sufficiently address the opportunities offered by E-bikes, nor did it recognise the wide range of benefits that result from investment in cycling infrastructure, and that these schemes offer very high value for money. We have also been delighted to note Transport Minister Jesse Norman MP has recently confirmed to the Guardian newspaper that a subsidy for the purchase of E-bikes “could happen”. Norman particularly noted in this interview one of the two advantages of E-bikes that we put forward in our submission: the potential of E-bikes to be used for freight transport. We also welcome the ambition that Jesse Norman MP stated in this interview – to “make the transition to a world where a 12-year-old can cycle safely”. However we were disappointed to note that Norman said he could not promise extra funding for cycle routes. Despite this Jesse Norman MP did say in this interview that Central Government could start pushing councils to build more cycle routes – and with the recent reported rise in air pollution in both the South Gosforth and City Centre Air Quality Management Areas we hope Central Government will take this action soon. As well as taking written evidence, the inquiry also held oral evidence sessions to explore topics in more depth. One of the questions asked was about the potential conflict of priorities: EVs versus access, broadening pavements, encouraging cycling and walking. 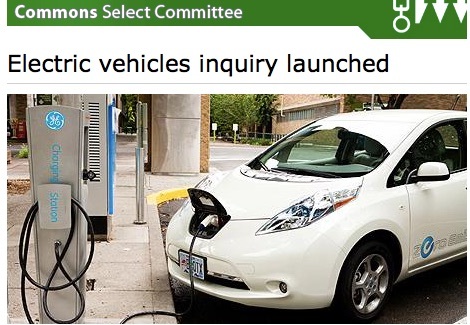 However, there was no real discussion in the session of the impact that the placement of on-street EV charging stations could have on pedestrians, so we submitted additional evidence to the inquiry on this topic in May 2018. Our key point is that as we install infrastructure to encourage EV use over more polluting vehicles, we should ensure that pedestrians in particular are not adversely affected through poor placement of charging stations. EVs will bring some benefits to cities, but it should not come at the expense of people more generally or the quality of the urban realm. For these reasons, recharging equipment should be placed so that it does not impinge upon safe and convenient movement of pedestrians on the pavement, should avoid placement on the pavement and avoid any trip hazards due to trailing cables when in use. Ideally charging equipment should be placed in the carriageway, not on the pavement. You can see below the evidence we submitted on this topic, including a range of photographs on different placements of EV charging stations. The output from the Inquiry, delayed by the 2017 General Election, will be published on the Parliament Inquiry Page when complete. To highlight the need to ensure that any actions to encourage EV use do not act counter to other actions to deliver the modal shift from private to public transport and to active travel (walking and cycling) that is necessary to achieve improvements in congestion and public health. SPACE welcomes the transition from internal combustion engine vehicles (ICEVs) to electric vehicles (EVs) because of the benefits in terms of reducing greenhouse gas emissions (dependent upon the electricity generation mix), local NOx air pollution and noise. However, the ICE to EV transition is not a panacea as it does not address other significant adverse economic and health impacts of a high car dependency way of life and high levels of motorised vehicular transport: delays due to congestion, the risk of injury or death from collisions, and the personal and public health consequences of physical inactivity and of particulate air pollution. We therefore support measures to encourage this transition while also recommending against the introduction of ‘on-the-road’ measures that incentivise or privilege EV drivers over ICEV drivers, such as permission to use bus lanes or contraflows that are not open to all vehicles or reduced charges for parking. Such measures would undermine efforts to achieve modal shift towards public transport and walking and cycling and so would impede progress in addressing the economic and health concerns set out in paragraph 5. E-bikes have a significant and complementary role to play in delivering a wider range of improved outcomes than EVs alone can: decarbonising transport, reducing congestion and improving public health through increased activity and reduced air pollution. We therefore recommend measures to address the barriers to uptake: safe cycling infrastructure and subsidy for the cost of purchase. These two measures are complementary and both are necessary to stimulate uptake of e-bikes in the same way that the early take-up of EVs was supported through both infrastructure measures (charging points) and purchase support. Transport, which is predominantly based around ICEVs, has a wide range of impacts, of which some (greenhouse gas emissions, noise and local NOx air pollution) can be improved by switching from ICEVs to EVs, while others (excess delays, accidents, physical inactivity and particulate air pollution) cannot. It is also important to note that the health effects of particulate matter (PM) are more significant than those of other air pollutants and PM emissions from EVs are comparable to ICEVs. the gains in life expectancy that could be had from eliminating man-made fine particles (7-8 months) is larger than those possible from eliminating motor vehicle traffic accidents (1-3 months) or second-hand cigarette smoke (2-3 months). 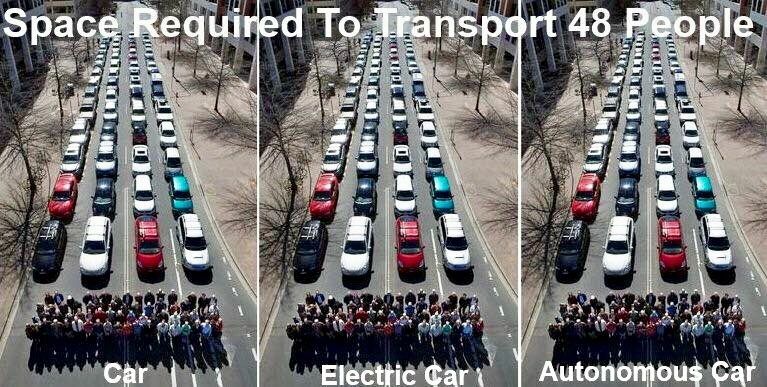 Our transport infrastructure should enable a choice of options for personal mobility that allow people to choose the most appropriate means of transport for their trip without necessarily having to use a private car with associated energy burden of transporting a tonne of metal when it’s not needed. We should foster innovation of how we travel, not just how our existing vehicles are powered. E-bikes are existing technologies so could be adopted rapidly and used as a launching point for a wider range of electric transport which might also include segways or any number of other ways of travelling. The key is a legal framework that allows people to innovate and urban environments where these modes can be used without fear of traffic. Having a range of low to high power electric forms of transport would also help to limit the need for new generation capacity and the impact on the power grid of mass uptake of EVs which use more electricity than low power electric forms of transport such as e-bikes. It is clear that while transitioning from ICEVs to EVs is a step in the right direction, it does not in itself address other significant pressing economic and health concerns associated with high car dependency ways of life and high levels of motorised vehicular transport: the excess delays from congestion, the risk of injury or death from collisions, and the personal and public health consequences of inactivity and of particulate air pollution. It is therefore important to take other, complementary, policy actions to improve those economic and health outcomes and to ensure that any measures to encourage the transition to EVs do not act counter to other actions to encourage modal shift in pursuit of those economic and health outcomes. We note and support previous and current national and local government measures to encourage modal shift through reducing the number of journeys undertaken by private vehicular transport and increasing the number of journeys undertaken by walking and cycling and by public transport. We consider that the potential of e-bikes to achieve multiple policy objectives, from greenhouse gas emissions to public health, has not yet been fully recognised. E-bikes are an electric powered form of road-based transport and so fall within the scope of this inquiry. Our response therefore addresses the benefits of and barriers to widespread adoption of e-bikes. E-bikes have a significant role to play decarbonising transport, reducing congestion and improving public health through increased activity and reduced air pollution. The batteries are rechargeable via a normal power socket and, unlike EVs, do not require any special or costly charging infrastructure. 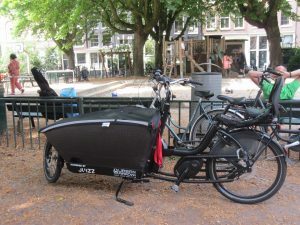 The battery can be used to boost the rider’s own pedal power as and when the rider requires which means that, compared to conventional bikes, e-bikes enable more people to cycle more distance and over hillier terrain more easily and to carry more weight, such as children or shopping. The boost effect means that people who are currently inactive or with existing health conditions can start to cycle with confidence, and that people who do cycle can carry on cycling with confidence despite any decline in health or fitness later in life. 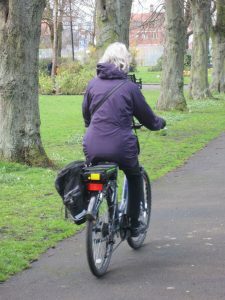 This potential for e-bikes to help people to become more physically active or to stay physically active later in life is an important consideration in the context of the widespread inactivity and associated poor health that was quantified in the 2017 report from the British Heart Foundation. 39% of UK adults (around 20 million people) are failing to meet Government recommendations for physical activity. Keeping physically active can reduce the risk of early death by as much as 30%. Physical inactivity has a significant financial burden on the UK healthcare service, with the direct financial cost estimated to be as high as £1.2billion each year. 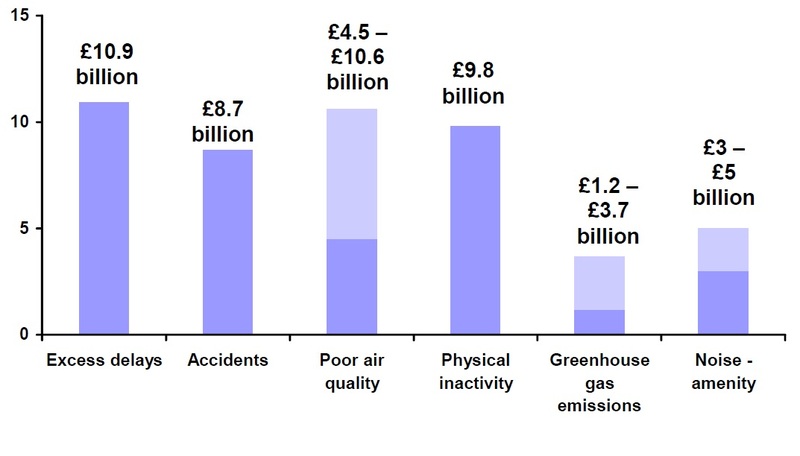 Physical inactivity also has a significant wider impact on the UK economy of as much as £1.5billion. The heavier loads that e-bikes can carry opens up new possibilities for freight. Local delivery and courier services could take advantage of the greater carrying capacity of e-bikes to use e-cargo bikes instead of ICEVs to deliver more and heavier items and in hillier areas. 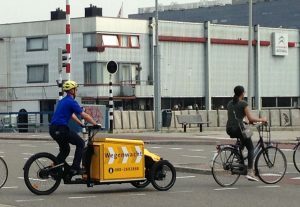 Such e-cargo bikes are already available and are starting to be deployed, for example DHL’s electric Cubicyle. What are the key barriers to development of the UK’s electric vehicle market? Firstly, different driving rules for ICEVs and EVs would also create confusion and present an increased safety risk for other road users especially the most vulnerable road users, pedestrians and cyclists. Secondly, ‘on-road’ privileges would undermine national and local government policy of the modal shift towards public transport, walking and cycling that is necessary to reduce the excess delays from congestion, the risk of injury or death from collisions, and the personal and public health consequences of inactivity and of particulate air pollution. Thirdly, whether or not such measures were effective in stimulating EV uptake, the need for them would disappear overtime as EV usage increases, but it would be politically difficult to withdraw these perks once drivers had become used to them and this would mean an ongoing conflict between actions to promote EVs and actions to promote modal shift. For e-bikes, there are two key barriers to the development of the market for e-bikes: the lack of safe infrastructure for cycling which we address here, and the higher cost of an e-bike compared to a standard bike which we address further on in our submission. Research in our home city of Newcastle upon Tyne in 2015 tells a similar story: 54% of people in the city said they could begin to ride a bike or ride their bike more often. When non-cyclists were asked about what kind of bike routes would help them to start cycling, 90% said traffic-free routes and 85% said bike lanes protected by a kerb. This evidence shows that the lack of quality of cycling infrastructure, in particular routes that are convenient and feel safe for cycling, is a key barrier to people taking up cycling. Since the cyclist’s experience of sharing the road with other traffic is the same for e-bikes as for conventional bikes, the lack of quality cycling infrastructure is a key barrier to the uptake of e-bikes. We therefore recommend a significant increase in annual investment on cycling infrastructure to overcome this to barrier to e-bike uptake. This should be ongoing and at a level equivalent to that which has delivered quality infrastructure and high rates of cycling in other climatically similar northern European countries such as Denmark (19% of trips are cycled) and the Netherlands (27%): these countries spend £24/person per year. In comparison, the government’s Cycling and Walking Investment Strategy will invest £316m over the 5 years from 2015 to 2020, which is approximately £1/person per year. However, there is widespread public support for a significant increase in public expenditure on cycling infrastructure to levels that match those in the Netherlands and Denmark: a survey showed that 75% support more investment in cycling, with £26/person per year the average amount people want governments to be investing. The Department for Transport’s assessment of a sample of cycle schemes found a benefit cost ratio (BCR) of 5.5:1 i.e. for every £1 of public money spent, the schemes provide £5.50 worth of benefit and “deliver very high value for money”. In comparison, the BCR for HS2 is between 1.4:1 and 2.5:1. We are therefore confident that investment in quality cycling infrastructure will be a very good investment of public money. To ensure that this investment delivers the quality of infrastructure that will provide people with a safe, easy to use and comfortable cycling experience, we recommend adoption of best practice in design and construction of cycling infrastructure, for example as documented in the London Cycling Design Standards 2014. This documents six core outcomes which ‘together describe what good design for cycling should achieve: Safety, Directness, Comfort, Coherence, Attractiveness and Adaptability. These are based on international best practice and on an emerging consensus in London about aspects of that practice that we should adopt in the UK. Does the Government’s Industrial Strategy sufficiently address the challenges and opportunities for electric vehicles? Regarding e-bikes, we consider that the Industrial Strategy does not sufficiently address the opportunities that e-bikes present to reduce wider transport related costs nor does it recognise that investment in cycling infrastructure can deliver a wide range of benefits to businesses, to individuals and to wider society and the demonstrated very high value for money for these schemes. There is a track record of subsidy for new technologies (such as photo-voltaic cells or EVs) to increase uptake while scale and technological advances reduce unit costs. We will not comment on whether and how fast the support for purchasing an EV should be reduced. However, it seems appropriate that support for purchase costs should be available for e-bikes for the same reasons and in recognition of the benefits to the individual, the wider community and wider environment, and reduction in financial health burden associated with car based travel. While costs of bikes vary, just as costs of cars vary, a typical e-bike costs approximately £500 more than an equivalent standard bike. This figure provides a basis for considering an appropriate level of purchase cost support for e-bikes and is modest in comparison to the subsidies that have been available for EVs: up to £4,500 for cars, up to £8,000 for vans and up to £1,500 for motorbikes. We recommend that this purchase cost support is used in conjunction with measures to improve cycling infrastructure. 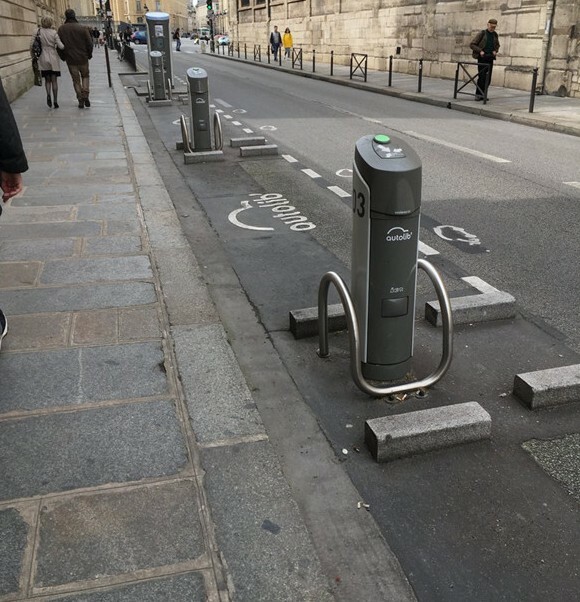 Improvements in infrastructure are needed for more people to see cycling as a viable option, just as charging infrastructure needed to be put in place for people to consider switching from ICEVs to EVs to be a viable option. In short, cycling infrastructure and purchase support for EVs are complementary measures and both are necessary to stimulate uptake of e-bikes in the same way that the early take-up of EVs was supported through both infrastructure measures (charging points) and purchase support. Is the Government’s road transport decarbonisation strategy sufficiently flexible to adapt to potentially disruptive market trends such as driverless cars? How might these impact requirements for, and use of, charging infrastructure? 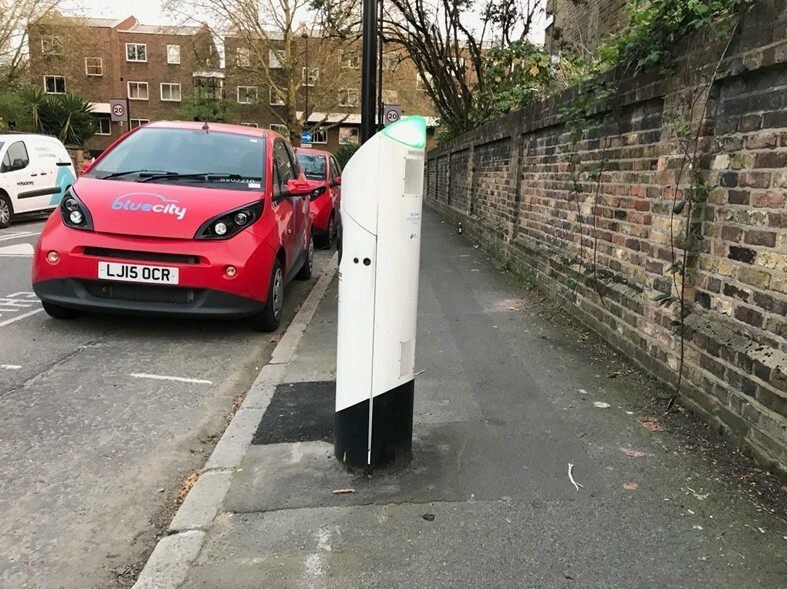 We have reviewed the 8th May 2018 oral evidence on charging infrastructure to this follow-on inquiry with an interest in Q260 “We talked earlier about the fact that no local authorities had submitted any evidence to the inquiry. We also have heard about the potential conflict of priorities: EVs versus access, broadening pavements, encouraging cycling and walking. All these are conflicting priorities. Talking about the issue of conflicts and alignment, how well do the priorities of motorists as well as local authorities, charging point operators and energy companies align when it comes to development of new charging infrastructure?” However the response given did not address potential conflicts in terms of the potential effect on pedestrians. The purpose of this submission is to put forward to the inquiry evidence on this issue. As we install infrastructure to encourage EV use over more polluting vehicles, we should ensure that pedestrians in particular are not adversely affected through poor placement of charging. EVs will bring some benefits to cities, but it should not come at the expense of people more generally or the quality of the urban realm. 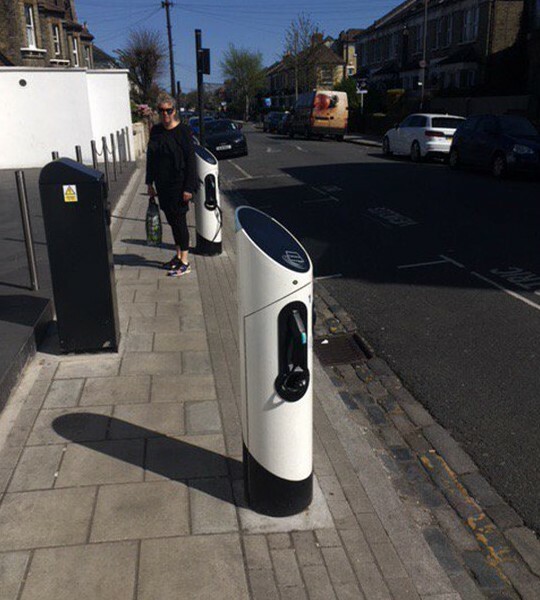 While many charging points will be in private premises and in car parks, some will be on-street and this is the subject of our comments as they have the greatest potential to adversely affect people walking or cycling (active travel) if not the needs of these groups are not adequately taken into account. The Department for Transport has an established hierarchy of users, placing pedestrians at the top, followed by cyclists then public transport, with unaccompanied private car-users last. 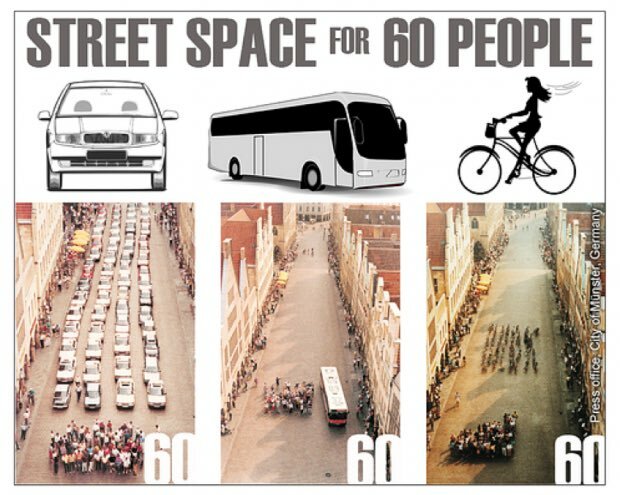 The objective of such a hierarchy is to ensure that the needs of the most vulnerable road users are fully considered. It further notes that disabled people require “level, clearly defined easy access and careful attention in the design and placement of street furniture, including resting points. Satisfying these requirements will also satisfy the needs of all other users, especially older people, people with heavy shopping/young children, and people with temporary impairments or low levels of fitness”. 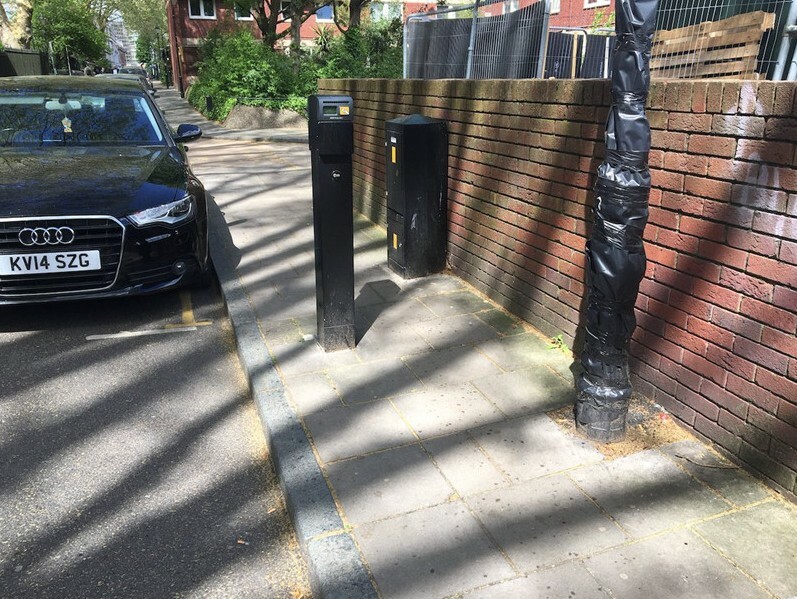 “Although much street furniture is provided for the benefit of motorised users, it is generally located on the footway and can contribute to clutter. In some circumstances, it may be possible to reduce footway clutter by placing some of these items on build-outs”. All the above considerations, applied to town centre recharging, are about making the town centre a more appealing and safer environment for pedestrians (everyone is a pedestrian when they get there, whatever their mode of transport). These considerations are also relevant to the High streets and town centres in 2030 inquiry. charging infrastructure being provided in the carriageway which does not adversely affect people walking (4-5) and which also accommodates cycle parking (6). 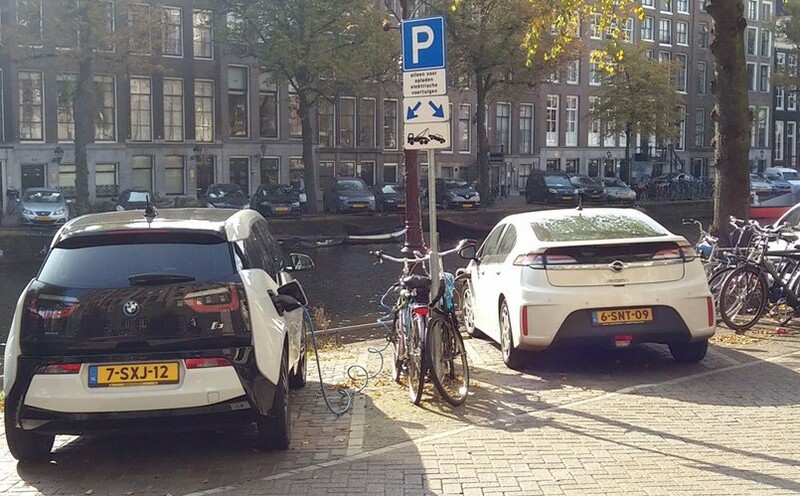 This last image also provides an example of how the same charging point could be used to charge electric cars and electric bikes if the design is appropriate.